Your love for decorating doesn't have to stop at the bathroom door. Continue your style into this traditionally private place by enhancing with high quality materials and features that transform it into an elegant and restorative space. Stone—like marble, travertine, and porcelain—along with rich, warm woods; beautiful fabrics and upholstery; and reflective crystal chandeliers and glass mirrors all help to create hotel- or spa-like escapes. Whether it's a master or en-suite, powder room, or regular bathroom, consult an interior designer or other professional to help guide you through the process, from creating more space to choosing materials. Opt for a clutter-free environment free of personal products, wet towels, and soiled clothing. Toilets: Bidets, "smart", or Japanese-style washlets, with convenient controls for washing, drying, warming the seat, disguising sounds, etc. Extras, if space allows, for luxuries like saunas, spa or whirlpool tubs, and side-by-side soaking tubs. A bathroom is the one room you start and end your day, so make it special. Ready for some fancy ideas? Enjoy 32 bathroom designs from Baroque to modern. Tracie Butler Interior Design continues the bedroom suite's design into the bathroom by using a mirrored vanity, mosaic-style mirror, and tile mosaics in the custom-designed shower. While a dark pink tufted velvet chair with lucite legs is definitely a focal point, other aspects are eye-catchers, like the vintage-stye leaf-pattern wall covering. Remarkably, this house was built around a custom-designed silver travertine tub, which sits in front of a large window that offers a view of a nature preserve and breathtaking sunsets. Designed by Jolie Korek & Company, the bathroom includes a trough sink top that matches the stone tub, along with shower walls and a floating vanity wall made of Skyline's Marble Slides polished mosaic. The étagère and vanity base are trimmed in walnut with Macassar ebony, while wood trim is stained-grey hickory. When not reflecting the owners' images, the mirror doubles as a TV. Flooring is also Skyline marble. The modern Bari chandelier is by Hudson Valley in polished chrome. The aim of this design was to evoke a sense of tranquility, according to Lexis Design, who let the spectacular ocean view be a natural focal point. Clean, smooth surfaces include Pietra Gray marble with a porcelain wall inspired by ancient Japanese fields of harvested rice. For a home in Scottsdale, Arizona, Ernesto Garcia Interior Design created an exquisite floor detail designed with mosaic tiles that claims the territory of a rug with more permanence. Intended to be the most ornamental element in the room, the tile rug establishes the palette. Mosaic tile designs are repeated on walls and panels throughout the bathroom. The linen cabinet was also custom designed. In the beautiful California coastal city of Carpenteria, Debra Kay George Interiors created a large Tuscan-style bathroom for a 10,000-square-foot estate that features a dome ceiling faux finished to match a stone mosaic, created by Buena Vista Faux and Mural. Other details include custom-made curved-front wood vanities, marble molding cut to arch around the mirrors, handmade wrought-iron lighting, and Giallo Reale marble flooring. Located in Los Angeles' Holmby Hills, this brick and stone estate designed by Richard Manion Architecture integrates the elegance of an English country house. Custom appointments include a tile rug design and wood cabinetry that house a bathtub and linens. The original plan was to raze the existing bathroom of this Dallas home and make it larger. As construction progressed, Gracie Reed of Grace Designs flexed her creative muscles. Among her ideas: to crate an arching window above the bathtub and barrel the ceiling. The arch shape was echoed in doors and the shower enclosure. The linen closet and vanities have specialty finishes using Modello patterns that were applied using Venetian metallic plaster and glazes. Cabinet and drawer pulls are made of mother-of-pearl. A boudoir-style bathroom for an estate in New Jersey includes custom-made vanities painted with Benjamin Moore Chelsea Gray- HC-168 and topped with a 2-inch-thick white marble slab. Designed by Susan Glick Interiors, the space also features tailor-made details like framed-mirror medicine cabinets, lucite vanity pulls, and 3D hexagonal white Carrara (with light gray veining) marble tiled wall. Pebble-shaped Foscarini Gregg pendant lights suspended over an oval tub invite a view into a lush Georgia yard. Created by Rabaut Design Associates, the bathroom features Gray Natural Q-stone porcelain wall tile, with Ann Sacks KOI ceramic accent tiles. It took a crane to lift the bathtub made of solid Carrara marble through the second-story window at an estate in Greenwich, Connecticut, that was once owned by the Rockefeller family. Designed by Vicente Burin Architects, the exquisite white bathroom is for the lady of the house; her husband's is across the hall and sports dark colors and finishes. In the space that was once a small master bath and two servants' bedrooms, the new bathroom features a fireplace, custom-designed millwork and cabinetry, along with flooring, shower, and pilasters made of Thassos, Badiglio, and Carrara marbles. Designed with privacy in mind, the door to the left of the shower leads to the water closet, while the one to the right ushers you into a walk-in closet. A series of small rooms were transformed into a larger bathroom of a Victorian townhouse in Boston that spans between the master bedroom and sitting room. Designer Jeffrey Delvy found French doors from 1870 that were centered on the wall opposite the bathtub, reflected in the mirror. Carrara marble was used for the walls and sinks, which were made by with reclaimed and replated metal legs. Not everything is vintage: the mirrors are touch-latched to reveal medicine cabinets. Right off, a turquoise tub is an eye-catcher. Greige subway tile walls mixed with marble and gold hardware and accents make for a perfect mash-up of Hollywood Regency meets urban chic. Designed by Eco Choice Interiors, this remodeled en-suite bath in Newnan, Georgia, includes marble countertops, custom cabinetry, artwork over the hand-painted tub, and French doors leading to the outdoors. "Let them eat cake," said Marie Antoinette, who would be right at home in this Baroque Beverly Hills bathroom that features a marble-edged tub with room for bath oils, bubbles, afternoon tea and macarons. Created by MI Design, this wonderfully decadent dream space includes antique mirrors, an ornate candelabra and amethyst chandelier, and a Pistachio-colored vanity to powder your wig. Topping it off: a vaulted (domed) ceiling with chubby cherubs. A chevron-patterned polished-stone wall adds interest to this slelek design from GIA Bathrooms & Kitchens of Bentleigh, Victoria, Australia. Against a limited palette, a splash of greenery brightens this calming space. Matte-black fixtures, trim, and hardware are a bold choice rather than traditional metals. Los Angeles is the land of many styles, as evidenced by this en-suite bathroom that blends touches of Art Deco, Moderne, and a wonderful blue wall that defies classification. A collaboration of Brian Klaas and Robin Dorman Design Concepts, the bathroom features black and white marble tile detailing on the "rug" and tub. Unexpected touches of vivid colors distinguish a modern home in Florida designed by Architecture Joyce Owens. All bathroom showers have brilliant mosaic tiles; the master bath's curbless corner shower is a stunning mix of purples. An iconic board-formed concrete structure located near Pacific Coast Highway in Pacific Palisades, California, sat neglected for years until SUBU Design Architecture and a team of professionals reimagined the space into a mix of Industrial chic meets California zen. Walls and floors of the new bathroom in this unit are made of Carrara marble panels, with plumbing fixtures by Waterworks. An eclectically furnished home in Winnetka, Illinois features a charming bathroom by Alan Design Studio that includes a one-of-a-kind flea market mirror, Porcher fixtures, and peach-colored wallpaper in a vintage design. With in-laws moving in with the family in Fairfax, Virginia, Moss Building and Design was tasked with creating a luxurious master bath that was part of a separate suite which also includes a bedroom, kitchen, and living space. The owners decided to repurpose furniture and accessories to create an area that reflects the tastes of their senior family members. Roselind Wilson Design was selected by the client to transform a 6,000-square-foot whitewashed Palace Court apartment in London's Bayswater into an elegant residence that would harmoniously wed three generations' varied tastes under one roof. The request for the master bath was to create a luxurious look with a modern twist, which was attained by setting a slim, curving tub against an antiqued mirror backdrop. Concrete floor tiles add color and texture to the scheme. The modern twist: a vibrant contemporary purple Gessi basin and fixtures. Designmas of Melbourne, Australia, wisely used a vine-covered privacy wall to create an intimate outdoor extension for the tub. 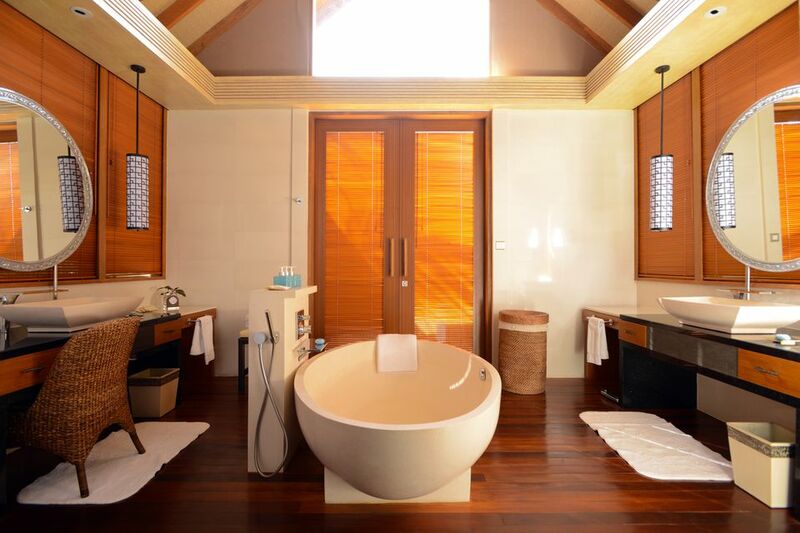 Set on a wooden deck-like platform, the tub flooring is flush with the outdoors, blending the two spaces. Modern conveniences like a steam shower, make-up center, and vanity with a concealed video monitor behind the mirror were integrated into this bright, spacious, and open design by Peters Architecture of Laguna Hills, California. Based in Birmingham, England, ProBuild 360 is a design/build firm that specializes in bathrooms and kitchens. This contemporary design is, indeed, a proper bathroom that includes a recessed tub in addition to a shower with body sprays. What distinguishes this design is an emphasis on clean, horizontal lines, found in the grain of the stone wall and floor panels, washstand, fixtures, and even the shape of the toilet. A crisp, fresh bathroom with an open window and was a design collaboration between Janet McCann Associates interior design and BBA Architects of Chicago. Outstanding features include white polished Greek Thassos marble mosaic tile (identified by its brilliant crystalline color that resembles sugar) and a tile floor that warms toes when the temperatures drop. What's the unexpected thing that Lisa Bell of Lisa Bell Design Group likes about her design for a home in Los Angeles' Bel Air Canyon? The juxtaposition of the concrete block wall exposed against the polished gray marble flooring. The countertops are made of leathered Calcutta marble with Kohler wall-mounted faucets. Tubs with views are definitely a thing, and this one at a home in Jackson Hole, Wyoming remodeled by Carney Logan Burke Architects offers a view of The Equality State's vast wilderness and landscape that changes with the seasons. Flooring throughout the house is a flamed and brushed limestone. Lucky guests who stay with the residents at this home in Montecito, California, near Santa Barbara, get to enjoy a pretty retreat with blue-tile walls designed by DD Ford Construction. Shampoo niches are made from the same white granite slab that was used to create the tub deck and apron. Intricate wood mouldings for this exquisite house in Maine were designed Architect + Builder, Knickerbocker Group and interior designers Urban Dwellings, who carefully detailed each piece to smoothly transition to the next while providing continuity throughout the home. Those curves are repeated in the graceful custom-designed cabinetry and the round window, which offers an unparalleled view. A Miami Midcentury Modern home received a reconfigured bathroom by Marc-Michaels Interior Design that offers more space for bathing and pampering along with privacy for the toilet. Materials and furnishings reflect the home's retro roots. Kent, England-based Catchpole and Rye designed a spa bathroom for a client in New South Wales, Australia, that centers a cast-iron bathtub on a raised-deck platform, which gives it a separate, spa-like feeling. Art Deco-inspired sconces and a mirror are centered and symmetrical for a balanced, calming effect. A handsome Midcentury Modern home in Lincoln, Massachusetts, was remodeled by Marcus Gleysteen Architects with upgraded materials that honor the colors and materials from when the home was built. That rich, warm wood ceiling is made from Douglas fir, while flooring is limestone tile in Seagrass. Duravit sinks and Dornbracht faucets complement Absolute black countertops with a leather finish. Boasting probably more square footage than most New York apartments, this ample and elegant master bath in Dallas has fine-quality materials and features like marble floors, custom mouldings, and wood cabinetry. Designed by C. A. Nelson Architecture Group, an alcove with a bay window is the ideal place to situate a freestanding tub, while a towel on the door knob hints at a sun-drenched post-soak nap on the balcony.